Thorough, up-to-date, comprehensive coverage of 3-D image processing This authoritative guide presents and explains numerous 3-D image processing, analysis, and visualization techniques, including volume filtering, interpolation, 3-D discrete Fourier transform, evaluation of topological and geometrical features, region segmentation and edge detection, skeletonization and registration, and visualization. Necessary theoretical background is provided for each topic, along with a number of algorithms, selected on the basis of their acceptance by the scientific community. The presentation of each technique includes a commented implementation, either in C code or in C-like pseudocode. Though presented in an almost ready-to-run form, the C code is simplified to expose the structure of the processing algorithms, rather than their programming details. This combination of theoretical treatment and C code implementation allows readers to gain a thorough insight into these techniques. * Accompanying transparencies summarizing the most important topics. 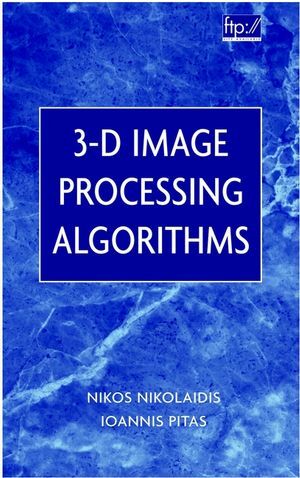 Based on the authors' long experience in research and teaching of 2-D/3-D image processing, 3-D Image Processing Algorithms is an indispensable resource for electrical, computer, and biomedical engineers, as well as computer graphics professionals and programmers. NIKOS NIKOLAIDIS, PhD, is a senior researcher in the Artificial Intelligence and Information Analysis Laboratory, Department of Informatics, Aristotle University of Thessaloniki, Greece. IOANNIS PITAS, PhD, is a professor in the Department of Informatics, Aristotle University of Thessaloniki, Greece.